Home » Astana » Restaurants » Restaurant "Rafe"
Sometimes everyone wants to escape from the urban fuss, to relax and do not think about matters that await us. And he immediately imagines the place with quiet atmosphere of comfort and coziness. And Astana has such place. This is the restaurant Rafè. The main advantage of this venue is its convenient location, prices at the level of city's cafes and, of course, the relaxing interior. All things were imported from Italy, and the design of the restaurant was invented by Italian designers. And it has given its effect - it's hard to forget the atmosphere of harmony with nature. Black walls perfectly combine with cream-color arm-chairs. Bamboo stalks in the walls, floors and tables stylized in imitation of wood, the glass ceiling with images of tree branches - all this creates the impression that you are in the crown of a huge tree. A light, passing through the glass ceiling perfectly complements the atmosphere of the virgin forest. In addition, the restaurant is divided into two parts, and visitors of the hall for non-smokers will not feel any smell of tobacco. As for the cuisine of the restaurant, it is also Italian. And the main culinary dish is the Italian pizza. In most cases, the pizza is prepared right in front of visitors: a chief cook from Italy and his assistants, using only fresh ingredients, will bake pizza in the special oven, which is located right in the hall. 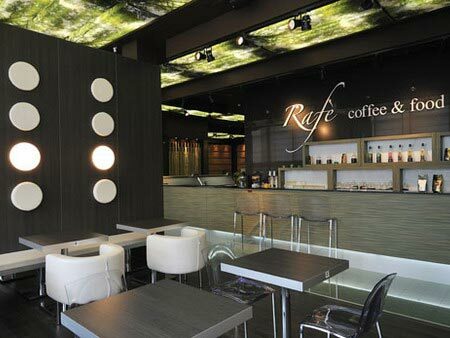 Besides the pizza the restaurant Rafè can boast the delicious dessert and coffee. One of unique features of the restaurant is the opportunity to teach yuor children to cook pizza. Sure, the child will be happy to be busy with making the dough, and then, under the supervision of skilled chefs to cook own pizza. Rafè is the restaurant with democratic prices and refined atmosphere, which will stay in the memory for a long time and will enter the list of favorite restaurants of Astana.